Your wedding day is ultimately one of the most important days of your entire life. So before you hire a wedding officiant or minister in Fallbrook, CA, you should make sure they are the right person for your big day. CEREMONIES specializes in providing every couple with the romantic wedding ceremony they dream of, and we know that you will enjoy working with us both in the weeks leading up to your wedding and the day-of. As the founder and owner of CEREMONIES, Janet Westall would be thrilled to serve as your wedding officiant or minister here in Fallbrook, CA. With more than 25 years of experience when it comes to officiating weddings, she is able to provide beautiful, personal services to those who turn to CEREMONIES. She can offer you support, guidance and friendship throughout the wedding planning process and make sure your wedding goes off without a hitch. What kind of wedding are you planning to hold? Small and intimate? Grand and traditional? The Fallbrook, CA wedding officiant or minister you choose should be able to adapt based on the wedding style you have planned. 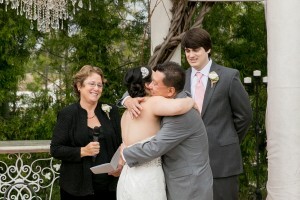 CEREMONIES can do just that, fitting seamlessly into the fabric of your special day. For those looking for a spiritual or religious wedding minister, CEREMONIES has you covered. Janet can assist those from many different religious backgrounds and incorporate religious readinghttps://www.bestceremonies.com/spiritual-wedding-officiant.htmls and blessings into your wedding ceremony as you see fit. CEREMONIES can also provide wedding officiant and minister services for contemporary or traditional weddings here in Fallbrook, CA. With years of experience performing traditional ceremonies, we can confidently design one exclusively for your wedding. If you and your partner are looking for an LGBT wedding officiant in Fallbrook, CA, you can trust that Janet Westall will do her best to create a ceremony that celebrates your relationship and the unique bond that you share. Janet Westall is also a bilingual wedding officiant who speaks fluent Spanish and English. If your Fallbrook, CA wedding requires bilingual or bicultural consideration, you can be confident that CEREMONIES will create an amazing ceremony and make all of your guests feel included. No matter what kind of wedding you dream of, CEREMONIES can help make it a reality. Call us at 909-730-7342 today for find out about all of the wedding ceremony services we have to offer.